One of the most important contributors to productivity is outstanding collaboration between business partners. In this brief (3:24) video, Amendola Communications Senior Account Director Philip Anast shares some tips he learned from the book Smarter, Faster, Better that explain how PR agencies and the client teams they work with can create a more collaborative relationship. It takes years to build brand equity, and just an instant to tarnish it. The best brands know the brand must drive every interaction with stakeholders, including investors, the media and the public. Failing to “lead with the brand” may result in lost opportunities to create loyal ambassadors. One crucial make-or-break moment for many brands is how they respond to customer complaints. For retail companies, this should be Brand 101. Healthcare companies, meanwhile, are only now starting to consider patients as consumers, due in part to the greater share of the cost of care being borne by patients through higher deductibles, co-pays and coinsurance. As patient/consumers have more “skin in the game”, demand is rising for a consumer experience that is more like what the best retail companies offer. Healthcare companies would do well to pay attention to best practices—and pitfalls–across the retail industry. So here is a “Tale of Two Brands”. Recently, my friend Eric and I had wildly different experiences with two popular consumer brands. Within an hour, Brandon had turned a customer with a complaint into a brand ambassador, offering to send another pair of pajamas, no questions asked. I did share my positive experience with friends and “Mom” networks. 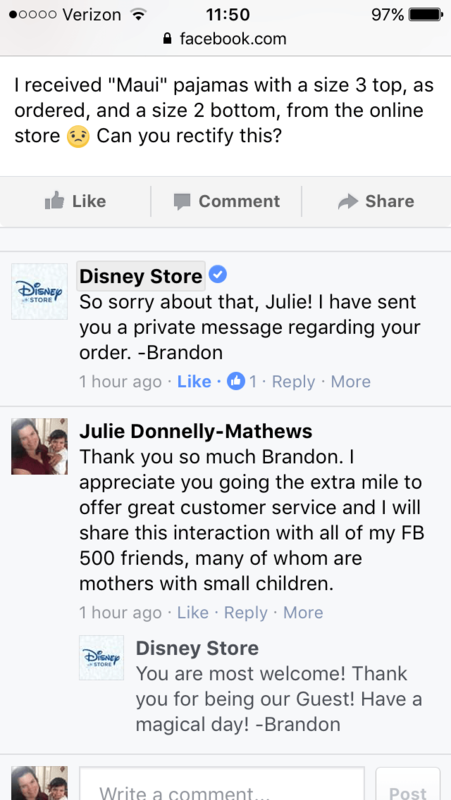 Also, Brandon suggested that I donate the mismatched pair of pajamas to “spread the Disney magic”, and since I have such a great feeling abut the company, I’m happy to do so. In fact, my opinion of the company is considerably higher than before I ever had this complaint. Your warranty claim #WKUS0181563ES has been denied. KEEN’s warranty program covers manufacturing and materials flaws for one year on original items purchased from KEEN authorized retailers. This warranty does not extend to items that were purchased from www.keenfootwear.com with promo codes awarded to satisfy previous warranty claims. Eric then started posting on his own Facebook page about his experience, with photos of the broken shoes. Then he reached out to the Keen Facebook page. Finally, four days later, the head of customer service reached out to Eric, asking him to order a new pair of his choosing to replace the ripped sandals. Assuming this next pair is good quality, Eric says he’ll remain a Keen customer. But his opinion of the company is damaged by the experience. It’s a tremendous missed opportunity because—though Keen doesn’t know it—Eric is an outdoor educator who interfaces with hundreds of kids (and their parents) each year. He runs a Pioneer camp in Florida which couldn’t be more “on brand” for Keen, as both emphasize the joys of “unplugging” and enjoying nature. Moreover, Keen has a enlisted a number of brand ambassadors who each “represents a convergence of KEEN’s values and interests”. Eric would be a great addition to that group. But, initially, Keen’s customer service operation failed to lead with the brand, and didn’t take the time to understand its customer and his concerns. Instead, it stuck to a blanket rule, and referenced Eric as a warranty claim number, not as the brand fan he was before the incident. So, what can healthcare companies learn from this Tale of Two Brands? Resolving a problem quickly is a key to maintaining brand loyalty. Disney is known for their lightning quick responses to customer problems, and my experience was no exception. Brandon responded to my query within an hour, while Eric had to wait four days before getting a satisfactory response from Keen. Now, to be fair, Disney is a much, much larger company, with many more employees, so it’s understandable that Keen’s response would take longer. Unfortunately, Eric did receive an initial response quickly, but the response did not seek to understand or resolve his problem. Disney was able to mail me a new set of pajamas with nothing more than my Facebook name and town. They knew exactly who they were talking to, when I had bought the pajamas, what size, and my address. This kind of sophisticated contact center is rare. But smaller organizations can ask questions to get the personal information and understand the particular needs of the customer, rather than refer to a warranty claim number, which was off-putting in Eric’s case. Since my Disney issue was resolved so quickly, I immediately offered to share my experience. But Brandon asked me to go one step further and share the replaced pajamas – which were good quality, but simply mismatched sizes. This may give the company the opportunity to earn another fan who becomes a customer in the future. It’s clear, at Disney, that the public relations and brand teams drive all interactions with the public. This creates a unified, top-to-bottom messaging experience, applied to anyone who interfaces with the company. Keen still has the opportunity to turn Eric into a brand ambassador. A great PR operation might seize this chance to engage Eric and his campers, since the camp and company missions are aligned. They could, for instance, give sandals to a small group of kids, then take photos of the campers for the Keen website or other marketing collateral. Healthcare organizations can become more like the best consumer brands by taking a proactive approach to patient complaints and concerns. By responding quickly to patient concerns, seeing patients as individuals, empowering staff to solve problems and asking newly-satisfied patients to refer their family and friends, healthcare organizations can help to create and retain brand equity. This, in turn, can help drive up patient satisfaction scores, which can have a positive impact on the bottom line, in new value-based care arrangements. Summer conjures many images that are symbolic of a slower pace – relaxing by the beach, sipping lemonade by the pool or reading a book under the shade of a tree. These relaxing pictures of a simpler time rarely include your marketing efforts, although they can fall into this summer haze if you don’t take steps to keep them amped up and the drum beat cadence strong. New customer wins, moving into an expanded headquarters and launching innovative products are obvious reasons to keep your name in the public eye; however, summer seems to have a way with slowing down major events such as these. How do you stay in front of your main audiences without appearing overly promotional? Conduct Surveys—Can you survey your customers to discover a new point of view? Do you have access to de-identified data within your product that could point to an industry trend? One example would be discovering which state’s residents are more likely to take their medication as prescribed than in any other state. Facts and figures are generally well-received and can support your company’s position. These results can be used for a press release, infographic, social media and media relations outreach. Create a Campaign—Develop videos, blog posts or other content addressing problems that your product solves and position yourself as a thought leader. Champion a cause or highlight a struggle like Healthsparq’s #WhatTheHealthcare and athenahealth’s #LetDoctorsBeDoctors campaigns. Branch out as a mover and a shaker to help fix a problem even if your product alone won’t do the trick. Doing this shows you as a trusted ally and advocate. Offer a Fresh Perspective—Your company has knowledge and a viewpoint that is unique. Does your CEO have a fresh position on leadership? What insights can you bring on the industry? Refine that information and share it through media relations, webinars and bylines. Reporters are looking for new ideas that shed light on a relevant topic in a vendor-neutral manner. Whether done on your own, with a customer or through partnering with a publication, webinars are a great avenue to harness your knowledge about a topic and share it in a way that gives a personal connection. Attendees can get a taste of your personality, in addition to knowledge on the topic, and the chance to ask questions depending on how the session is structured. Contributing articles to publications is also a great way to extend thought leadership by sharing your perspective in your voice. Support a Charity—There are many great causes. Perhaps your company already supports a charity, which would benefit from an event or donation. Another option is to find an organization that allows personal involvement, such as sponsoring a build day with a Habitat for Humanity® site near your office. Not only will it be a great team-building exercise, you could get some local press for your efforts. Employees and customers enjoy working with socially responsible companies, so it is a win from all sides. Everyone hits a slow news cycle at some point. Use this time to refine your position, create a conversation and support a great cause. Each of these methods will extend your brand and deliver more content, including for your social channels. Thought leadership is arguably one of the most powerful assets in an organization’s or individual’s public relations strategy. Yet relatively few companies go after the thought leader mantle, even if they have articulate, charismatic, true believers leading their organizations. Often these potential thought leaders are kept preoccupied managing the present or near-future, while others who have an eye on the longer-term are hesitant to put their true thoughts out there, especially in the buttoned up world of business. And so, intriguing perspectives never see the light of day, including those that could establish a company or person as an industry player to watch. By contrast, if you do a fair amount of thinking about the future, are amenable to investing time and effort into building your thought leadership profile and you’re willing to shake things up in your industry–then yes, you have the makings of a thought leader. So where do you go from here? First, decide on what you want to be known for. Then decide on a correlating cause to champion. Let’s look at a well-known role model who has this approach down cold. He’s extraordinarily rich, has a tempestuous romantic life and an unusual name. But above all, Elon Musk is an entrepreneurial futurist. That’s what people think first about Elon Musk, and that’s no accident. I’ve long studied Musk’s thought leadership mode of operation and have distilled it to a simple pattern. First, he warns of a dire likelihood if humanity doesn’t get its act together. This generates significant buzz…and fear. After a suitable amount of time has passed, Musk then follows up with a proposed solution. Example: society will collapse when we run out of fossil fuels. Solution: Hyperloops that transport us at 700+ miles per hour. Another example: society will collapse if artificial intelligence takes over the earth. Solution: merge human brains with artificial intelligence. Here at Amendola I’ve developed a list of questions to provoke thought leadership thinking. I’ll share some of them here; for the full list, and more info about how Amendola builds and promotes thought leadership profiles; email me. Question #1: If you could sound one alarm in your industry, what would it be? Question #2: Do you have a minority and under-reported view of an industry topic that is significantly at odds with the widely held and established view? Question #3: If you could rally your industry with one inspiring message or goal, what would it be? These questions will likely prompt some interesting thinking, which leads to the next step—what to do with these profound thoughts. In brief, you should put them into blog posts, articles, interviews, presentations and more, with a solid PR strategy to help promote your thought leadership message. Consider investing in media training, as well. In addition to our writing and PR services for thought leaders, Amendola offers in-depth media training, facilitated by experts with years of media experience in television, radio, newspapers and the internet. And much more. The media training can be as short as one hour to longer, depending on your needs. We typically offer this training as a core component of our PR programs. Don’t forget another time-tested public speaking strategy: joining Toastmasters. In her post “Public Speaking Tips for the Timid and the Talented,” my colleague Michelle Noteboom details how participation in Toastmasters has upped her speaking game and given her newfound confidence. So there you have it—a formula for success as a thought leader: an interest in the longer term, a willingness to shake things up in your industry, a solid PR plan, and a plan to practice until you’re close to perfect in your message delivery. That’s really what it takes to be a thought leader. All that’s left is for you to take the leap and start becoming one.